Italy brings with it many wonderful treasures and one of the things that it is famous for is its stunning range of tiles; nowhere else are you going to find tiles with such amazing designs and this is one of the reasons why the TAORMINA linen collection has been created with this in mind. Whether you opt to buy the napkin, tea towel or tablecloth, all have been brought to life by making the most of this traditional Italian artistry and skill. 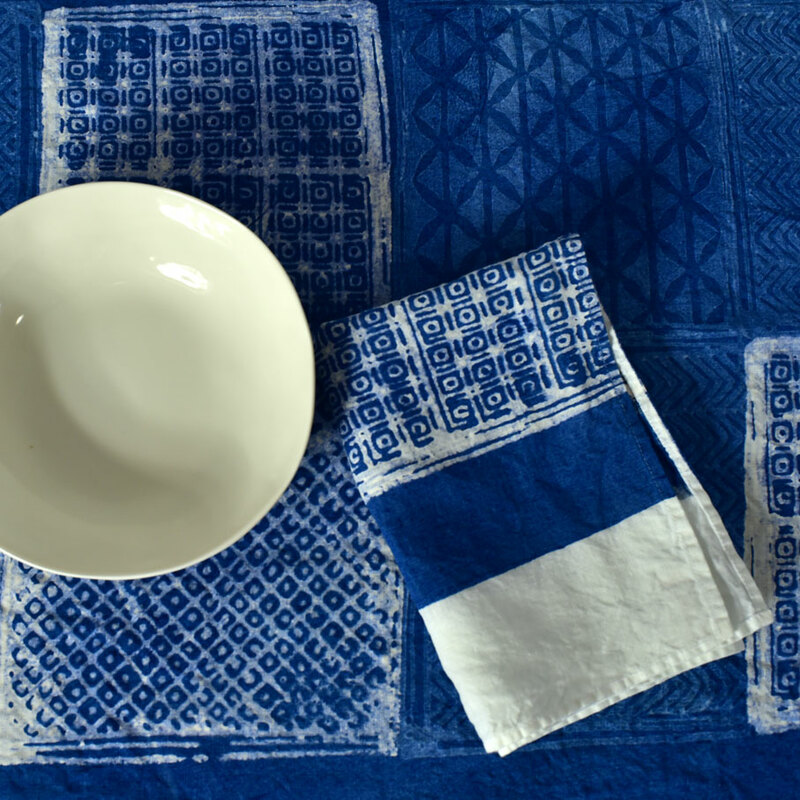 The TAORMINA napkins display the same delightful tile motifs as shown on the other matching items within the range. 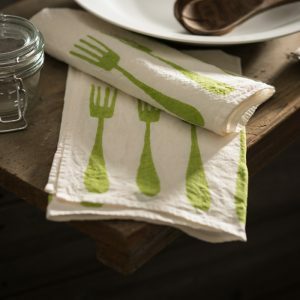 All in a mix of natural tones and shades, these patterns have been carefully printed using hand-carved blocks onto linen that has been home-spun; imagine the busy shuttle looms working away and spinning out swathes of pure organic linen cloth and you have a picture of how the napkins begin their life. 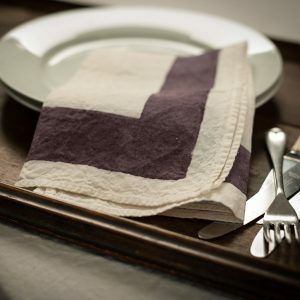 Long-lasting, tough and practical, this linen retains its natural crumpled look making the napkins incredibly easy to look after as they don’t need to be ironed to look at their best. 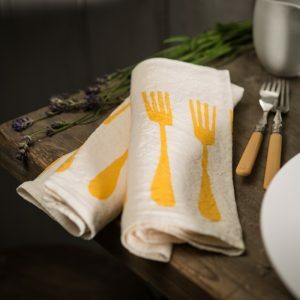 The blue one is both hand-painted and printed, while the mustard one is purely printed. 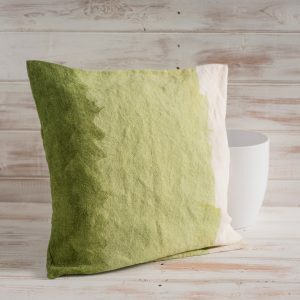 Both colours complement each other and you can mix and match them on your table, or opt for one single colour choice, depending upon your taste and home colour scheme. 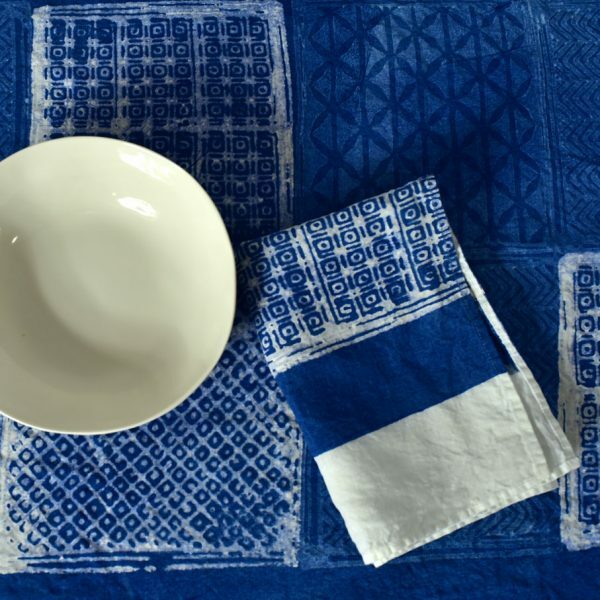 Each individual napkin has been stitched by hand and then carefully decorated with original colours and motifs being based upon local tiles. 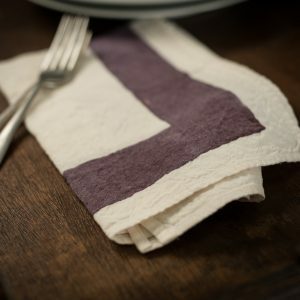 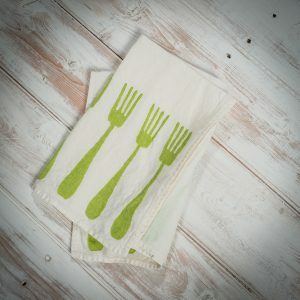 Here you will be reminded of the lush Italian countryside and Mother Nature at its best; whether your taste runs to being modern or very traditional, these TAORMINA napkins will be wonderfully at home in any type of setting and add to your delight when dining. 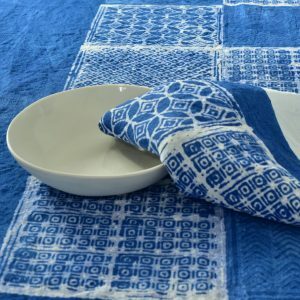 With so much time and energy going into creating each item, the small family businesses that create them apply every attention to detail from start to finish, both when spinning the linen cloth and applying the hand-painting or carved-block paints. 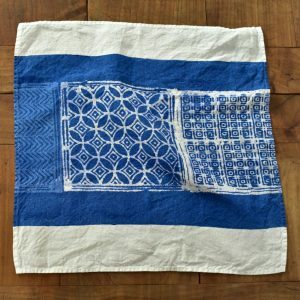 Nowhere else but within this region will you find cloth or designs of such quality; particularly unique and cherished, they are often treasured by families for many years, being passed on down as family heirlooms along with matching tablecloths. Chemicals are avoided at all costs and only natural mineral and vegetable dyes are used when painting by hand or stamping with the wooden blocks. 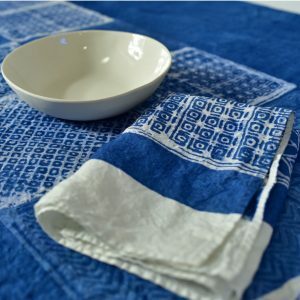 Not only is the linen tough and incredibly long-lasting, no matter how many times you wash it, the colour will not fade and will remain looking as beautiful as the day it was applied due to the designs being set at very high temperatures. 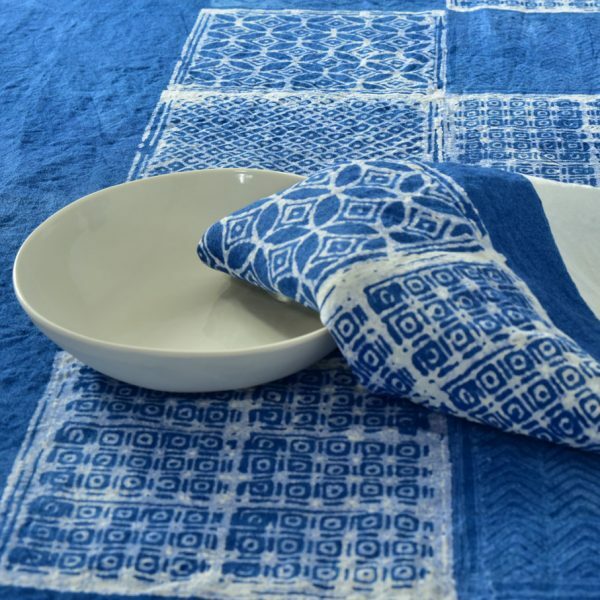 Whether you are purchasing for yourself or as a gift for a loved one, when you purchase from AllÓRA online you are becoming part of a rich heritage of items produced by famous Italian artisan houses such as this one by Stamperia Bertozzi. 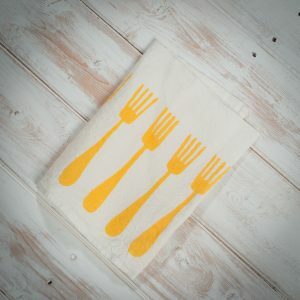 Here you will find the perfect accompaniment to your table, whether you are hosting a family dinner, casual garden party or celebratory occasion. 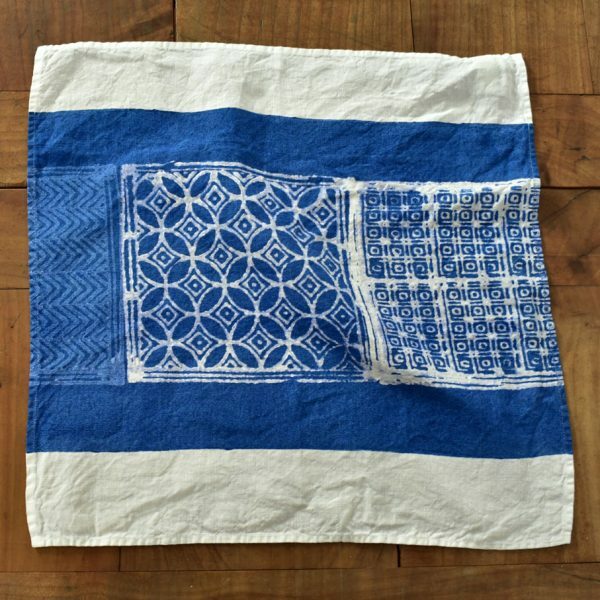 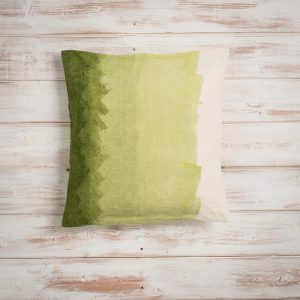 Shop at AllÓRA now and begin your collection of stunning TAORMINA hand-crafted linen items to add to your home.